This is the first turkey I've ever killed and I did it with a longbow. I'd like to thank everyone on here for posting your tips, ideas, and trial/error results, they really are helpful. I killed this bird on 4/23/07, at 7:20 am. I was hunting at the bottom of a field hill in the corner. I had taken a piece of burlap and stretched it between two small trees and tied it up. I put out two decoys, a blow up jake and a blow up feeding hen decoy out in front of me at 10 yards. I had called three times with a box call and had heard some gobblers way down below me, so I decided to try a slate call. I called once, waited 5 minutes, and called again. Not hearing anymore for a couple of minutes, I laid the call down and sat back in my folding chair to maybe I thought take a catnap. That's when they appeared. Ten jakes total running over and down the hill. Six of them started to peck the blow up jake decoy, two of them circled the hen decoy, and two of them stayed at 15 yards puffed up. They all looked about the same size, and honestly at that point I was so surpised and shook up, it didn't matter to me anyway. I picked one out right in front of me, drew my longbow, and released. He jumped up flapping his wings, making me think I had shot underneath him at 10 yards. I watched all of them trot up the hill to about 20 yards and look back toward the decoys, not knowing what had happened. The jake I had aimed for started limping toward them, but I couldn't see my arrow in him or on the ground. I reached for my backup and nocked it and started to raise up out of my chair for another shot. All of the jakes started to trot on up the hill, except the limping one, he took two hops and was airborne. He flew 30-35 yards and crashed landed in a logging road. I got out of my chair walked around my burlap blind to the road and found him laying there in the last phases of life. He weighed about 14 pounds, had a 2 1/2" to 3" beard (depends on how much I pull it :D ), but he's the best game I've taken yet with a bow. Didn't think I'd even get a shot off, let alone harvest one. I used a Bear Montana Longbow, 55lb, 28" draw. Easton XX75 2018 arrow at 29 1/2", with a Magnus 100 grain glue on head and a 26 grain broadhead adapter. Arrow had complete pass through. I had hit him just above his right hip, and back about one inch. It didn't take the first pic, here it is. Hmm still didn't take, oh well it was just my ugly mug anyway. good job Bobby! what are you gonna do with the wings?? I promised them to Bill, but if we get anymore, I'll keep you in mind. Do you want LW or RW? Nice bird. What an acomplishment! be proud be very proud! Nice bird and great story! Great bird ! and nice story. There is nothing like the first one ! first bird , and with a longbow! good job,congrats. Congrats! 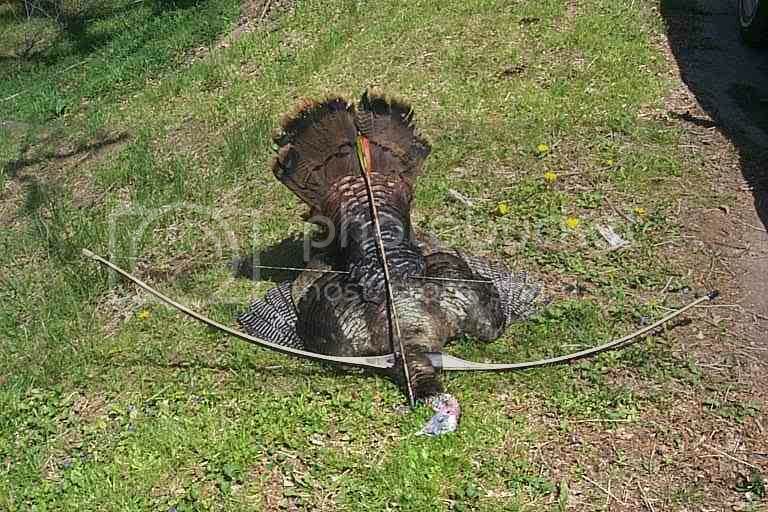 Turkey with a longbow has to be one of the toughest out there. Proud of ya. Awesome and what a nice bird and nice bow to boot. Congrats glad to see my trad brothers are putting birds on the ground!